Real Madrid are back in action today after the end of the international break, taking on Eibar in their away game in La Liga at midday. Los Blancos are looking in better shape following the appointment of Santiago Solari as manager to replace Julen Lopetegui. 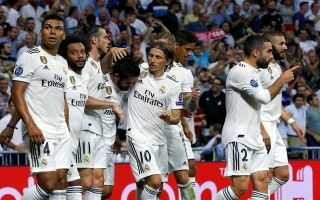 Madrid will want to keep that up today to continue to pile the pressure onto Barcelona at the top, though an away game at Eibar will by no means be a formality. Indeed, Real have only won two away games in La Liga all season, while Eibar have been pretty strong at home, winning three. Solari will have to have his wits about him to get Gareth Bale, Marco Asensio and co. playing at their best in attack, while there’s also the unwanted distraction of the Sergio Ramos doping scandal that broke yesterday evening. Will it unsettled Madrid? Well you can make sure you keep an eye on all the action by grabbing yourself an Eibar vs Real Madrid live stream by signing up to Eleven Sports!